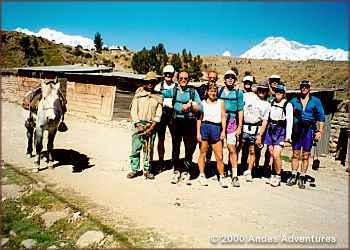 Andes Adventures: "Dances with Llamas" By Bruce Hoff. This wasn't the high pass of the Ausangate loop as I had hoped. He pointed out the trail that lay ahead. It dropped a thousand feet to a crystal blue lake below, then climbed steeply even higher to a barren saddle near the crumbling edge of a massive glacier. "Dios mio," I said. I guess my gringo vocabulary was succumbing to the local tongue the way my body was succumbing to the local air pressure. We waited for the other seven in our party, breaking out the carbo-bars and granola we had packed for the day, and offering a bit to our guide. Sometimes when we offered he'd accept, but often he preferred to chew on his coca leaves, which took care of altitude effects, hunger, and fatigue, while adjusting one's attitude and providing a curious numbness to the cheek and tongue. The pass we sought was close to 17,000 ft., the high point of that 22 mile section of trail. It took us well over eight hours to complete this, the longest of our four days on the 45 mile loop. Our guide, and the porters who set out days in advance to set up our overnight camps, christened us the "campeones de los turistas", since most hikers for whom they work take about week to complete the same loop. We were pampered by the camp arrangements. Our trip organizer had arranged for us to spend four of our ten nights camping, the balance in hotels. The hotel rooms were unexpectedly fine, the camps nearly as nice, and all had sumptuous meals. Our porters had brought a tent for each pair of us hearty adventurers, a mess tent with table and chairs, and even a latrine-tent. At the end of each day's journey we'd spot our collection of tents and arrive to find tea and snacks being prepared, an appetizer before dinner. On two of our three nights in the Ausangate, we camped by thermal hot springs, and so had a hot bath before supper! Our guide arranged for us to have Chilean wine with dinner, and on several nights a local entrepreneur appeared out of the darkness with a case of ice cold beers, scalping them for a hefty three soles each (about a dollar). I wondered if I'd ever again be able to face camping with my bivy sack and freeze-dried meals. The trip is the brainchild of fellow southern Californian, Devy Reinstein. We met while training on the Angeles Crest course about three years earlier, and discovered that we both dreamt of running the "John Muir Trail", which runs along the crest of the Sierra Nevada, connecting Yosemite valley with Mt. Whitney with over 200 miles of spectacular scenery. Sometime after we completed that trip, with the seed of adventure running planted in his mind, Devy returned to his native Peru to visit his family and pursue some business interests. In his free time, he ventured from coastal Lima up to the high Andes. While on the train to visit the historic Incan ruins at Machu Picchu, he learned that the train stopped near the head of the "Inca Trail" which ran over 50 km (and close to 14,000 ft of altitude in several places) ending at the ancient Incan city. Against the protests of his fellow train riders, who cautioned him that the trail required several days to traverse, he sent his luggage ahead, laced up his running shoes, hopped off the train, and hit the trails. Reaching his destination later that evening, he realized that the area offered a unique blend of wilderness running and archeological exploration, which he could share with other ultrarunners. After exploring the area further, he settled on the itinerary for the inaugural trip. We would fly from the U.S. to Lima, Peru, then fly up the mountains to Cusco, which was the capital of the ancient Incan empire. We would travel through the Urubamba valley to the head of the Inca trail, which we'd run all the way to Machu Picchu. After touring the ruins for a day, and taking a train ride back to Cusco, we would head the opposite way from the city toward the mighty Mt. Ausangate, to circumnavigate during four days. (At 20,900 ft. Ausangate is the highest peak in the Vilcanota mountain range.) We'd then return to Cusco to tour the local ruins and partake in modern festivities at the huge Cusqueña beer festival, before returning home. With so much to take in during the trip, the decision was made not to arrange the trip as an ultramarathon race, but rather as a running tour, allowing ultrarunners to reap the benefits of their fitness during a unique excursion. Seven of us met in the Los Angeles International airport. As we went through Lima and Cusco three more joined the group including our guide. We boarded a private bus in Cusco, and headed northwest to the Urubamba valley, where we explored Incan ruins, visited traditional market places, and were treated to a demonstration of Indian weaving. That night, after dinner, at our hotel in Urubamba, there was a flurry of activity as we each divided our belongings into several parcels. In order for us to run the remote trails, without carrying our belongings, a logistically elaborate plan had been developed. The plan involved utilizing several groups of porters who would split up and head to different camp sites, preceding us by days. We arranged to send different articles of clothing, and other items, to wait for us at the planned camp sites. Late the second afternoon we arrived at the ancient Inca Trail, thirty three miles from Machu Picchu, in the town of Chilca. Machu Picchu's location in the high, rugged Andes, is so remote that the Spanish conquistadores, who razed most of the Incan civilization, never encountered it. Even today no roads lead there. There are only two ways to reach it, by train or on foot. We ran about five miles to Llactapata, where the first group of porters had prepared a campsite. En route, the Inca trail ran though a valley, which was reminiscent of the grand canyon, but with glaciated peaks high above. Our tents were nestled at the base of massive Incan stone walls, where we arrived just as darkness set in. After a good night's sleep and a healthy breakfast, we set out to run the Inca Trail. In millennia past, the people used this trail to travel from Cusco, their political capital, to Machu Picchu, which may have been a religious center. They would bear their king, the Inca, along the rugged trail. (The word "Inca" referred to their king only. Later westerners erroneously applied it to the people in general, and it stuck.) Eschewing the bearing of royalty, we found the trail to be taxing none-the-less. The trail began by running parallel to a river. We occasionally passed villages, small clusters of mud huts, with handfuls of farm animals out back. It was clear that our single track trail was their "Main Street". We were informed that there might be a store in one of these villages. A "store" was a nondescript mud hut with four bottles (three kinds of soda, and a Cusqueña beer) on the ground in front. That was the message, and the advertisement of their wares. No billboards here. The trail abruptly turned right and headed uphill, to a meadow called Llulluchapampa (pampa means meadow) at 12,400 ft. We passed hikers speaking various western languages, with pack animals or Peruvian porters carrying their gear. It was impressive to see porters, with huge loads on their backs, walking almost as quickly as we. We climbed steeply to Warmiwanusq'a pass (Quechua for "Pass of the Dead Woman"), at 13,800 ft. She must have died of asphyxiation. Descending on a wide, but rocky trail, we encountered an aid station! Our guide had arranged for someone to hike to this valley and boil water from a nearby stream, adding coca leaves to make a green tea. (The coca helps with the altitude.) The pail of this "mate de coca" was placed on a blanket, with a bunch of granola bars arranged around it in a pretty pattern. Turning uphill, and passing some stone ruins, we summitted another pass and began descending. The end of the trail was below 8,000 ft., so I eagerly anticipated cruising over 5,000 ft. of downhill. 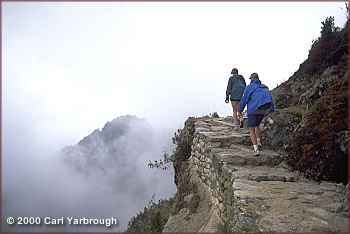 But the Peruvian attempt at paving the trail with stones created a surface so uneven that a relaxed gait was impossible. Fog began to surround us and the vegetation grew more lush. We were well above 11,000 ft., but in a jungle. An alpine jungle! 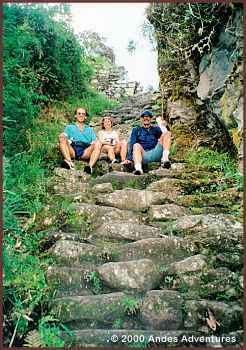 We encountered a series of hundreds of stone steps, built by the Incas, and descended at least a thousand feet. The steps were smooth, slippery and high. Running was done with great caution. Eventually the steps changed to familiar, comfortable dirt trail, cut in easy switchbacks. We reached the ruins of Winay Wayna (in English: "forever young"). A long traverse along the mountainside allowed us to see a mighty river, the Urubamba, paralleling us 2,000 ft below. We'd later take the train along that river, returning to Cusco. We climbed slightly and passed through some ruins, as one enters a gate. Looking beyond we suddenly saw Machu Picchu, below, in all its glory. The stone ruins of a large city, perched atop the most inaccessible ridge, with stunning views in every direction. Surely the Incas appreciated the rugged grandeur of these Andean environs, when they undertook the toil of building so large a city in so remote an area. A ten minute jog brought us to the heart of the ruins. Two thousand feet below, the town of Aguas Calientes lay beside the Urubamba and the rail line. As we arrived at our hotel, our porters appeared, each bearing a huge load of camping gear and our luggage. Sweating and fatigued they plopped down outside the hotel. They had been instructed to carry the gear from our campsite to the train tracks (a mile or so) then hop on the train to Aguas Calientes. But they discovered the train was on strike, and did what any good employees would do: They humped the gear twenty kilometers along the tracks to their destination. We enjoyed a fine dinner, and were entertained with live, traditional music. The next day we returned to Machu Picchu for a private tour. The city is full of archeological mystery: Why was the city built? It's hypothesized to have been a religious center, or maybe a summer retreat for the elite. The vast majority of human remains found there were female. Were they vestal virgins who served the temples? The Incan stonework is of unparalleled precision. Huge blocks fit together perfectly without mortar. Elaborate techniques of mating stones (such as tongue-in-groove) and trapezoidal archways insure stability. Modern earthquakes that ravage Peruvian cities barely disturb these ancient walls. The technology for shaping and fitting the stones is unknown. We "ran" up a steep spire called Huayna Picchu, towering 1,000 ft. above the city. Machu Picchu sits atop a ridge, and Huayna Picchu is at the ridge's terminus. From either side of the ridge one can look down to a river below, but it's atop Huayna Picchu where the complete picture hits the tourist like an anvil: The Urubamba, now 3,000 ft. down, made a hairpin turn around the nose of the ridge. So it's the same river on either side! It's as if you stood at the rim of the grand canyon gazing into the abyss, then spun around to look down an equally deep chasm, carved by the same river. Never had I been surrounded by such rugged terrain. I pointed my pitiful panoramic camera in every direction, and at every angle, but couldn't capture the majesty of the scene. Mist swirled around the tops of the mountains, the Cordillera Vilcabamba, surrounding us. After a train ride back to Cusco, and night's rest there, we headed in the opposite direction, for a dusty five hour ride on a dirt road. The road climbed thousands of feet up a mountainside. We passed groves of Eucalyptus. Later the surroundings seemed to be simply barren dirt. But there were signs of agriculture. Patches of dry, barren earth were furrowed. The people living here grew potatoes. We had arrived at the beginning of the dry season, after the harvest. The potatoes were gone and the earth was prepared for the next planting. As we reached the summit we saw, beyond our brown hills, a glacier covered massif looming on the horizon. It was our destination, Nevado ("snowy") Ausangate. The road switchbacked down the other side of the mountain, ran along the Mapocho River, and eventually arrived at the small town of Tinqui. Tinqui was the "low" country, at the base of our trek, at a mere 12,400 ft.
Our afternoon's work consisted of covering about eight miles, gradually uphill through meadow lands (Peruvian "puna"). Suppressed by the elevation, we walked most of the way. It was humbling to go from the self image of an "able bodied trail runner" to that of someone able to do little more than hike. The route followed a minimal dirt road, then single track trail, then no trail. But once in a while we'd encounter a white arrow pointing the way. Devy had arranged for a local to precede us, carrying a bit of flour, to place occasional trail markings to insure that no one lost the way. As our group strung out, Devy would remain in the rear, and Ciriaku, our local guide would go with the front runners. Ciriaku, who had shown Devy the loop some months earlier, was called "El Loco" by his neighbors, because of his affinity for long distance trekking exploits. The perfect guide for us! We reached our campground at Upis (about 14,500 ft.) in the late evening, and dipped in nearby hot springs before sunset. 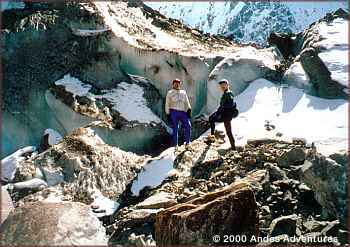 We had been approaching Ausangate from the north, and the glacier on its north face grew larger as we approached. Though temperatures quickly dipped below freezing after dark, we stayed warm by donning the clothing we had sent ahead, and crowding into our "mess tent" to sip hot coffee and tea while waiting for dinner. Ourwilderness dinners were always three courses (soup, entree, desert). Water was boiled and cooled for refilling our personal bottles, while we ate. The convenience was nearly embarrassing. In the clear night sky we saw the Southern Cross and other, unfamiliar, constellations of the southern heavens. We rose early the second day, to take on the longest leg of our trek. By the time we had finished breakfast it was warm enough to dress in a long sleeved tee and tights. Peru is nearly equatorial, and temperatures don't change much year round. Though we visited late in their autumn, and were at very high altitudes, it was surprisingly comfortable. Peru has a rainy season and a dry season. Our trip was at the beginning of the latter. We experienced no rain or wind during our trek, and the sky was peacefully blue, with puffy clouds. We quickly ascended past 15,000 ft. Running was possible, but the elevation and uphill made walking the more popular choice. I found walking to be comfortable, but when I switched to a shuffling "run" my lungs were immediately gasping for the rare oxygen. At home I'm limited on my long runs mostly by sore, tired legs. Here my muscles and joints weren't being taxed, but my heart and lungs were working overtime. I think that was all the Spanish they knew, for when I would shrug my shoulders and reply "No lo tengo" they didn't seem to understand. Between my English and their Quechua, there was a pretty big language barrier. The last few miles to Palomani pass were grueling. The trail blazers had never heard of switchbacks. My lungs and legs seared as we surpassed 16,000 ft., heading straight up. At the pass, our two Avocet altimeter wearer verified that we'd reached about 16,500 ft. The thought then popped into someone's oxygen starved brain that we had a unique opportunity to reach 17,000 ft. To the west the ridge met the Ausangate glacier, but to the east it rose gently to a hilltop. I listened to the developing plan with my throbbing head between my knees. Damn those altimeters! As the group headed up the hill, I crawled behind. Finally the dials clicked over to 17,000 ft. We rejoiced, snapped some photos, and started downhill. We arrived at the next camp, Jampa, at the days end. A second group of porters had been waiting with the tents pitched and the food cooking. I felt thrashed and needed to rest. Several of us were a bit woozy, here at 15,500 ft., and we looked forward to returning to the Tinqui "lowlands". The night was clear and the brilliant luna llena lit up the snow covered peaks all around. Several times we heard the distant rumble of avalanches. The third day covered a mere 9 1/2 miles, but included Campa pass, which was nearly as high as Palomani. We paused to explore some ice caves, at the glacier's edge. Then it was runnable downhill, through puna, passing lakes and streams, all the way to our third camp, Pacchanta. Our porters from Upis has taken a shortcut after our first night, to arrive and set up this camp early. Our Jampa porters, with the gear strapped to their horses and llamas, arrived shortly after we did. The scene was becoming a grand reunion! Devy wanted us to experience a traditional pachamanca meal. A whole lamb, covered in spices, was buried in a underground fire, with a variety of potatoes. When those delicacies met our amplified appetites, the result was a pachamanca-frenzy, with ribs and potato skins flying around the mess tent. That evening Devy took care of the gratuities, which the porters anxiously awaited. In addition to some money we donated, Devy had collected from us old, unwanted running shoes and other clothing. In a makeshift ceremony, each helper was acknowledged for his duties, and the money, shoes, windbreakers, and hats were distributed. They seemed overwhelmed by the distributions, and Devy later told me it was much more than they were used to receiving. The final morning we experienced some long awaited trail running. We ran downhill back to Tinqui. As we neared the town, we merged with Sunday-market goers, their pack animals bearing their wares. It was an Andean swap meet! Our bus arrived, and we returned to Cusco, stopping at towns along the way for food and souvenirs. That night we attended the final evening of a massive, multiday outdoor concert, the Cusquena beer festival. The next, final day we toured Incan ruins and Spanish cathedrals, in and around Cusco. Devy toured Incan ruins and Spanish cathedrals, in and around Cusco. Devy convinced the tour guide to dig up a pair of running shoes and a water bottle, and give us an unprecedented running tour of the ruins. We were driven up into the hills outside Cusco, and ran back down, pausing at various sites for learned explanations. We ate lunch at "El Cuy", where the specialty is bakedguinea pig, though none of our group ventured to try the dish. At our final dinner that night we each received an ornate Incan copper plate, engraved with the name and dates of the trip. There was a frenzied exchange of phone numbers, as no one wanted to lose contact with what had become a tight knit group. The next morning half the group caught a flight to L.A. via Lima. Three departed the Andes to explore the low country, one continued his South American surfing safari. Devy went to meet his Indian contacts, to explore more remote trekking circuits. Several days later, three of us met at the base of a local Californian peak, just under 11,000 ft. high. Running a familiar 50K loop, for the first time I enjoyed it without suffering from the altitude. I returned home a bit sad, knowing that in another week my red blood cell count would be back to normal, but happy to have had the experience. I snuggled into my baby alpaca sweater, tasted my Peruvian "Pisco" liquor, and daydreamed of future exotic treks.